created by James Cameron and Harlan Ellison. 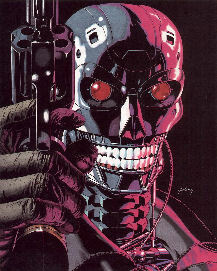 Dogs bark at the smell of a terminator. The 'T' class replica droids initially started off as a safe alternative to using human miners by the Kelpeth Corporation on Maltus-5, as it turned out the mining coalition got up in arms about the fact that they were being wedged out of lucrative contracts and protested. The millions of credits invested in the droids caused Kelpeth to rethink their idea and they then took to fashioning the droids with a synthetic flesh to integrate them in with the workers. When the mining interests that the Kelpeth corporation held took a turn for the worse they sold their holdings and moved the droids into 'combat' operations selling them to the highest bidder. The problem became that the Empire began to restrict the sales of droids and slapped restrictions of how droids could act and function. Kelpeth has ordered to cease any further production of the 'T' line. They did so, in accordance with the law, but they had millions of units and sold them off to the highest bidders with all the replacement parts the buyer could carry to recoup their losses. "They can't be reasoned with. They don't feel pity, or remorse, or fear and it absolutely will not stop EVER, until you are dead!"